There are almost 8 thousand Bradley airport parking spots available to the general public. These are a mix of hourly, daily, weekly, short-term and long-term choices. Many travelers at Bradley airport have found out long ago that knowing where these parking spaces are located is important to acquiring a great spot. According to J.D. 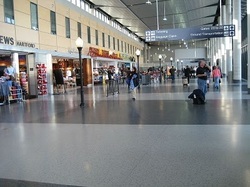 Power and Associates’ airports review, fewer than 10 million passengers use Bradley International Airport (BDL) annually. Despite its size, parking at Bradley airport has always been an issue. In recent years, improving Bradley airport parking has been relentlessly pursued. Bradley airport parking on-site is strategically placed and can be easily reached via walkways or by free shuttle service. Adjacent to terminal A are two parking garages – the Short-term Garage and the Long-term Garage. Lot B is another short-term parking lot just a few minute’s walk from the terminals. 4 additional long-term parking locations are available via the airport’s shuttle service. Parking at the Short-term garage and Lot B at Bradley is at $2.50 for every 30-minute period and $4.50 for every 1 hour. Daily parking at Lot B is slightly less at $16 than at the Short-term Garage, which has a daily rate of $24. These garages are the best parking option for people who are staying for less than 1-2 hours - just picking up a family member at the airport. On-airport, a selection of daily parking spaces can be found in the Long-term Garage and in Lots 1, 3, 4 and 5B. The Long-term Garage is a mere 100 feet away and has the best half hour ($2.50) and hourly ($4.50) rates, with a daily rate of $20. Its weekly rate is $140. The most budget-friendly parking are in lots 1, 3, 4, and 5B which can be reached via shuttle service. All of these locations have an hourly rate of $4. Lot 1 has a daily rate of $11 and a weekly rate of $77. Lot 3’s daily rate is $8, with a weekly rate of $53. Lot 5B has the least expensive rates, published at $6 daily and $42 weekly. Remote BDL parking garages and lots can save you money with their rock-bottom discounts and promo offers. A couple of topnotch parking companies that come to mind are FastTrack along Ella Grasso Turnpike and Park Shuttle & Fly along Elm St. They do provide free shuttle service on demand all day long 7 days a week. The ’Stay Park Fly’ arrangement through most Bradley Airport hotels is a very attractive alternative, as well. Clarion Inn and Suites, for instance, offers free parking for up to 15 days, with standby shuttle service, starting at $89 per night. They’re located along Bridge St - just 4 miles from the airport. Bradley airport parking doesn’t have to be a bothersome task for you. Just do a little online search to familiarize yourself with your options. Always confirm rates with off-airport facilities for the best discounts available. You’re bound to discover a solution that fits your budget if you search in the right places.